Zexum high quality Fire Rated Cable, suitable for use with Fire Alarms, Emergency Lighting, Automatic Lift Doors, Air Conditioning and Computer Control Rooms where low smoke, fume and zero halogen cable is required. A quality, well constucted product which is easily stripped and worked with. 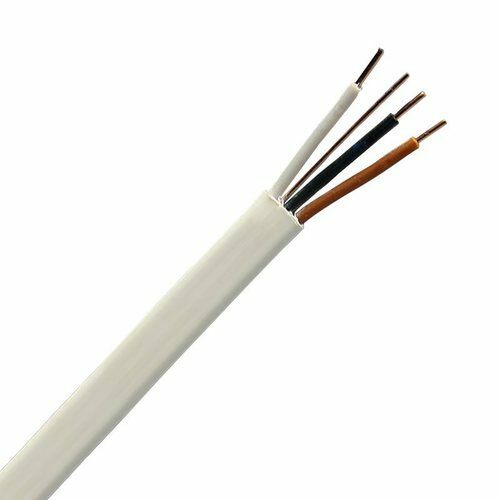 High quality Plain Annealed Copper Conductors, Insulated with Fire Resistant Silicon, Screened with Aluminium Foil with an outer sheath of White Low Smoke Halogen Free Thermoplastic. Tested and certified to meet the the following standards; BS EN 5839-1:2002+A2:2008 Clause 26.2d (Standard Fire Cable), BS EN 50200:2006 + Annex E 30 mins (Fire Resistance Standard), BS EN50200:2006 PH120 (Fire Resistance Standard), BS7629-1:2008 (Fire Resistance Standard), BS 6387:1994 Clause 11 CWZ (Fire Resistance Standard), BS EN 50267-2-1:1999 (Halogen Emission Standard) and BS EN 61034-2:2005 (Low Smoke Standard). It is also suitable for Emergency Lighting Standard (BS 5266-1:2011), Voice Alarm Systems Standard (BS 5839-8:2008) and Voice Communications Standard (BS 5839-9:2003). This Fire Rated Cable is manufactured in the UK using state of the art technology, equipment and materials with product tracing and test processes to ISO 9001. Designed with installers in mind, easy to install with superb working flexibility and simple, easy termination with no troublesome multiple sheaths to strip which as a result saves installation time and effort. The cable cores are designed to provide the highest levels of data protection, ideal for long cable runs and analogue and addressable fire systems.